Marutomo Katsuo Bonito Flake Hana, 16-Ounce Units by Marutomo at The Flavour Stack. Hurry! Limited time offer. Offer valid only while supplies last. A packet of finely flaked tuna. Katsuobushi (dried, shaved tuna flakes) is used in so many Japanese dishes it would be impossible to name them all! A packet of finely flaked tuna. 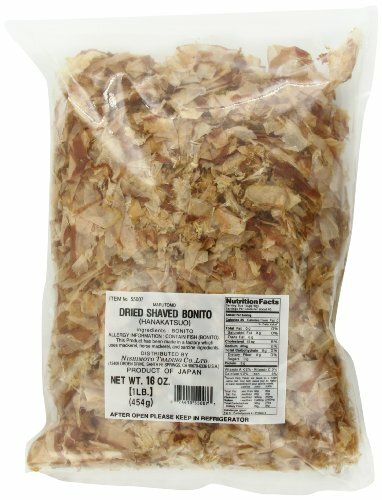 Katsuobushi (dried, shaved tuna flakes) is used in so many Japanese dishes it would be impossible to name them all! From miso soups, broths and noodle bowls, to simple tofu plates, natto (fermented soybeans), chahan, okonomiyaki, takoyaki, salads and even puddings. Extremely rich in flavour, and brilliant even as a simple topping on rice, katsuo is a staple for any Japanese cupboard. If you have any questions about this product by Marutomo, contact us by completing and submitting the form below. If you are looking for a specif part number, please include it with your message.